One of my regular target partners shoots recurve with all the bells and whistles with the exception of a clicker. He was formerly a Master Bowman but succumbed to target panic a couple of years ago where he constantly froze using a clicker, unable to draw through or release after the click. After a couple of months away from the sport he came back and started from scratch until he was back up with the big boys at 100yds looking for Bowman all without a clicker. I’d been filming another archer earlier in the morning when he asked me if I could video him for a few ends too which I was happy to do - when we reviewed the footage in the comfort of the club bar after the session it was immediately apparent the flaw in his technique was a variation of draw length shot on shot with a few shots drawing almost an inch short of his optimum and impacting half a target boss low. He knew this was the case but wanted to see it in action - we discussed ways to address it but both came up blank. Is it possible to achieve a solid consistent recurve draw without a clicker ? If so what methods / exercises / strategies do people recommend to achieve this ? And there used to be the "check-it" mirror... Reflective surface with a line: you could see (in the reflection) when the draw reached a consistent point. But... Will that help? If someone gets hung up on a clicker, then there's likely to be the potential to get hung up on any sort of draw check. The only exception to that I could think of would be something akin to the draw-stops or wall on a compound, but I don't think anyone has come up with something similar for a recurve. Though it's true that if you had something which did not have a physical link to the shaft, you could just say "sod it" and let go anyway, when you get hung up. I'm not sure that would lead to great results, though. The thing is, getting hung up on the clicker (and those short draw shots without it), are symptoms rather than causes. If the shot was right, they would not happen. So I guess what is needed is to identify the problem and fix that. This guy at the BUTC, bronze medal match hit (I think) the disc on all eight of his shots. That's a 60mm disc (Portsmouth 10 ring). No clicker. And some of the top barebowers can be very consistent. 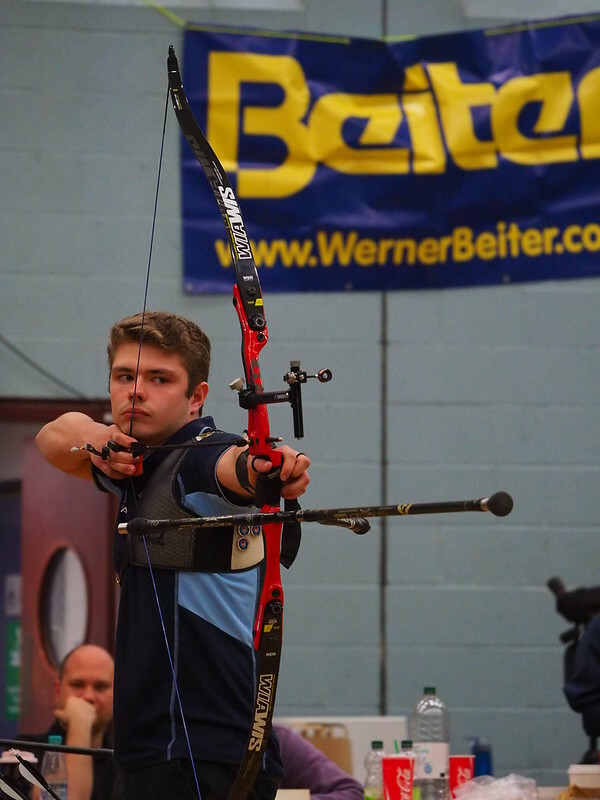 At our fita 25 last year Jason shot a 564 (I think, 562-564) with a barebow, beating all the the recurves and most of the compounders! Thanks all - we discussed top barebow archers not needing a clicker and that is a wonderful shot Bimble. As as you say Rik any sort of clicker could well trigger his previous TP issues so with that in mind in all probability he will continue without any device and just pile in the practice until that sweet spot in his draw becomes second nature again. I would say that the reason(s) for the variations need to be looked into. Does the head move forwards or back in relation to the bow? Does the bow shoulder rise further on some shots? Is the draw elbow coming round into line each time? Is he pulling with his biceps? The variations usually stem from the very early movements made when raising the bow from its "down at rest position". I think a good draw starts with the stance and the turning of the head( nothing else)towards the target.... often the shoulders swing round with the head to get a better view. Then raising both arms to eye level. Then drawing the bow while the bow arm is almost stationary. Drawing to the face, not the face moving to the string. By making one clear move at a time, it is easier to spot when unwanted movements are being made, and which ones they are. Karl, I think I have your email address and I guess you have mine. I seem to remember watching a video of your good self once. Did you email it to me? If that is the case, you could possibly email your video of this friend to me . Crick-It Clicker/Draw Check for Flatbow? What is the Ruling on Consistent Draw Length in Field Archery? By icky in forum Methodology, Tuning, Coaching etc. By Beardy in forum Methodology, Tuning, Coaching etc.